Are you looking for a place to build friendships, receive focused instruction, develop your faith, and have an incredibly fun time while doing that? WLD Ranch seeks to be such a place. Established in memory of a young man whose vision was to share Jesus with the children in his neighborhood, WLD Ranch’s mission is to guide campers and guests to Jesus as the Truth in life. Conveniently located near two interstate highways in northwestern Pennsylvania, our neighborhood continues to grow as people come away to a life-changing experience. Our staff strives for excellence in service as we represent Jesus to all who come through our doors. We offer summer camps, weekend retreats, horse retreats, and more. Summer Camp at WLD Ranch is an experience your campers won’t soon forget. The unique mix of friendship building, focused learning, faith development, and fun activities gives your campers a taste of life at its fullest. Our summer staff welcome your campers into camp life and your campers return to you with memories that will last a lifetime. WLD Ranch facilitates weekend retreats for youth groups, men’s groups, women’s groups, college groups, and more. We provide a peaceful setting for your group to build connections, renew commitments, and explore God-given purpose. Our retreats allow you to focus on your group while we supply the setting for your ministry to take place. 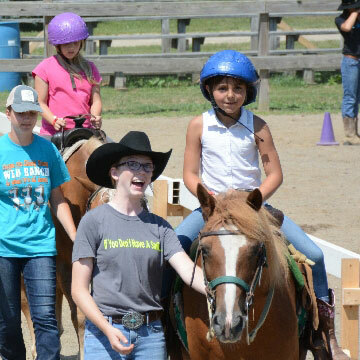 Our horse retreats allow Girl Scouts and other groups to focus on riding and learning about horses. These weekends are packed with a variety of classes and experiences, including riding, grooming, and caring for horses.